A few days ago I was driving my car full of art supplies from the studio in Kalispell to a Wine bar in Whitefish to host my first class at Cypress Yard. As I was driving, admiring the beautiful landscape mountain views that Highway 93 provide, I realized just how different this drive is from my drive on the same road, one year ago.  Let me take you on a journey, of how The Artisan Oyster was born. It all began when two of my co-workers said to me "Want to go to a wine and paint class?" I had been painting for 10 years and knew how to paint, but I liked my friends and any excuse to drink wine. It was hosted at Wild Eye Artistry, an art gallery in downtown Kalispell, Montana (it's not longer there, now it's Yoga Hive). We painted some birch trees with a green background. I wasn't super interested in the painting, but enjoyed the environment and started to add in my own details and style. The instructor was very pleased with my ability to take the steps to the next level. There were two girls leading the class, one was the instructor and later I found out one was the owner. I connected with her after class, she really liked my painting and we exchanged numbers. I had no idea why or where it was going but it just felt like there was something more to that class. Two weeks later I received a text from the owner, saying she needed an instructor for the next painting class. I had never taught classes before, but the painting was already decided, and had pretty simple steps. It was a Halloween painting, and Halloween is my favorite holiday. Teaching my first class ever! Things went well, I taught a few more paint and sip classes at the gallery throughout the holidays. Learning how to control a group drinking wine, how to explain the steps to beginners, while also leaving space for those who wanted to explore their creativity farther. I started to see some people coming to class and doing exactly what I did in that first class, taking the steps to another level. Adding in elements, changing up the composition and colors. The gallery closed down unexpectedly, and we were in need of a new venue- and fast. The owner found a space that we could rent on event-by-event basis. So, the events were held two Thursdays a month, at the Fairbridge Inn and Suites in Kalispell. We had consistent paint classes from January-June, averaging about 20-35 people per class. I began to observe the classes, how people interacted with one another, and how these events were so much more than just "Cork and Canvas." It was a gathering where no one sat on social media, we were all creating something new instead of consuming our feeds, connections were made between new friends of all ages, and seeing the light on faces when they realized what they painted in two hours with some instruction was so exciting. Around June of 2017, the owner moved away and I took over all aspects of Kalispell Cork and Canvas. Here is the first class I hosted on my own at the hotel. I continued to host these paint classes in the hotel, learning how to run a event website, how to promote events on Facebook, and how to create new and exciting paintings, adding the fan brush and pallet knife additions to my art tool kit. The more I dove into these events, the more I realized it was so much more than a paint and sip business. It is a brand centered on creativity, connecting, and indulging in a few hours spent to yourself. I didn't want to be lumped in with the whole idea of the "Paint and Sip" industry where tons of people pile into a loud bar, drink too much, and create a painting that was copied off Pinterest that ends up in their closet at home. I wanted to create a space where people come and explore their creativity, whether that involved alcohol or not. A place where any level of artist could come, not just beginners. A place where we would make real art, something you are proud of, and that you hang up on the wall at home. Original art. A place where we didn't take ourselves too seriously, we still made mistakes, but learned in the process. I began brainstorming new names for the business. I wanted to give it a fresh start. I also wanted a name that would grow and transform. Eventually I wanted to teach art classes in Whitefish, Bigfork, Polson, and Columbia Falls. Create things that aren't on canvas, or to create mixed media collages, not just paintings. That it didn't have to involve wine, you could bring whatever drink of choice, or just a coffee. The name came to me in October 2017. I was reading a research article published on the major trends of the past 10 years. Athletics and focus on health was one (which totally popularized leggings as actual pants) , and Handcrafted, Artisan goods was another (i.e. the rise of Etsy, craft breweries, etc) Implying things that are handcrafted, elevated, unique, and one of a kind. Which was the product of these paint classes I was teaching. Adding Oyster to the name was unconventional, unique, and different. I told many people about it, and most everyone said "Eh, maybe go with something else." Branding experts told me that it was too obscure, and that I should stick with a name that says exactly what my business provides. But something inside me just clicked. And I always listen to that voice. It's how I ended up in Montana in the first place, which is another story for another time. How did I find the word oyster? Quite accidentally actually. I was waiting for an order of chicken fingers at Burger King (the most amazing treat) and reading the Kalispell paper with all the funny and random facts in it. It mentioned that a baby oyster is called a "spat." Did you know that? I did not. I thought it was funny, and unique. But I wanted a reason as to why the two words would be put together. A little brand story. So I started researching, and came across the process that oysters undergo when they create a pearl. It's quite an ordeal, lots of scientific processes going on inside, while the oyster deals with the varying weather patterns the ocean throws at it. Its messy, gritty, and sometimes feels like such a burden. But the end result, is this beautiful pearl. That gets to be put on display in a multitude of ways. The painting process is the same way. You start out with a blank canvas, and through an artistic process you create a beautiful end result. Sometimes it gets frustrating in the middle when your working with all the layers and they don't really seem to look like anything. But slowly the composition comes together and all the little paint marks you made along the way look like a finished product. I hired a graphic/website/logo designer to help me put this concept onto paper, and the internet. A website that evoked those feelings of creativity, elevated products, but accessible and easy to navigate. Business cards that were memorable, and a logo that was eye catching. AnnaKate from Rhema Design Co was the perfect fit. She understood my need to create a unique brand, but something that people could connect with. We connected on Instagram (which is where I find the inspiration behind a lot of my paintings as well) and did all of our work over the phone and email. At this time I was still working full time at Herbergers, having just finished up the year and a half remodel and expansion of the Kalispell store, and was riding on the high of a job well done. We had no clue that a foreclosure and liquidation were in the future quite yet. Since I worked in the Kalispell Center Mall, I knew there were some vacant spots that were quickly filling up with temporary holiday stores. The idea hit me like a ton of bricks- why not open an art studio here in the mall?! I already spend most of my time here with work, I can go paint, drink wine, and relax with my classes after work. So that's how the studio was born. The process of designing it was quite fun, and I'll write about that in another post. I wanted it to fit within this aesthetic that I was creating while working with AnnaKate, my graphic designer. Everything was black and white on the website, except for the paintings, allowing them to be showcased. So I thought why not have the studio look the same way? I spent 2 days painting the tall walls black, covering the floor with Jackson Pollock inspired drop cloths, and hanging my painting demos on the walls. Three days later I had my first painting class in the studio. This was November 17, 2017. In March of 2018, my new website and branding was ready, and I was just finishing up my job at Herbergers so I thought it was a perfect time to launch the new name. So, that's when Kalispell Cork and Canvas became The Artisan Oyster. I had done a photo shoot with Lindsey Gardner a few weeks prior so I could have some awesome photos for the site. Looking back on one year, a lot has changed. I launched a new website, social media accounts, business name, created business cards and flyers, located a studio space, collaborated with a local winery, wine bar, and distillery to hold classes, created 18 new paintings to be offered, hosted multiple private events in the studio as well as in peoples homes, joined the Kalispell Chamber of Commerce, took out the entire back page ad of the Kalispell Visitor Guide, was featured in an article by the Daily Inter Lake, partnered with the Kalispell Center Mall to offer free art classes to kids once a month, and learned a hell of a lot about starting, running and expanding a business. But the most important thing out of all this, is that i've lead over 800 people on a painting journey from start to finish. Showed them that they can be creative, even if they've never picked up a brush. I've ignited a passion for painting inside people that they didn't even know was there. And to me that's more important than any achievement. So, if you read it this far, congratulations. I'm a wordy person, but I think the details are what makes every story unique. Thank you to everyone who has created with me this past year and a half, in the gallery, hotel, studio, winery, distillery, or in your home. You are what makes this so much fun, and what makes me want to keep bringing art classes and creative events to the Flathead Valley. It's cliche, but it's true. I seriously could not have done this without you. I want to continue to become a better art instructor, bring you new and fresh paintings, expand your mind and push you past those creative boundaries, whether your picking up the paintbrush for the first time or the 1000th time. I'll be waiting to cheers you at the end of your creative journey.